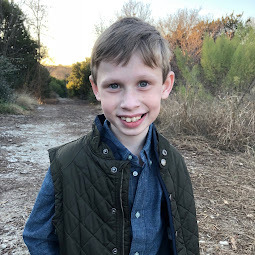 Bennett Brinson Gamel: Fighting Cystic Fibrosis: Bennett heads back to school tomorrow! 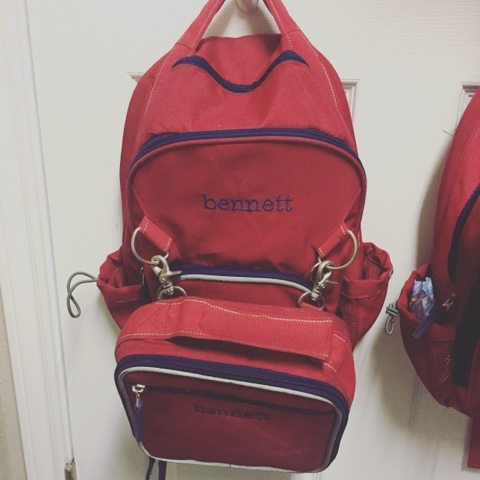 Last Monday, it became clear Bennett was not going to be able to go back to school. Bennett's bowel control was keeping him on the potty so often that he couldn't do much else than sit there. As his mom, it was pretty pitiful to watch. Everyone was deeply disappointed by this delay in going back to school as it came on the heels of a two-week hospitalization and challenging recovery. But, on Thursday of this past week, we began to notice things were improving ever-slowly. Each day, it seemed, was slightly better than the one before it. This weekend, we made a few small trips out as a family and, each time, Bennett seemed to do better than we expected. So, Brian and I talked it over and decided we should try sending Bennett to school tomorrow, even if only for a few hours. Bennett is SO excited! Bennett hasn't said much about not being in school for more than 4 weeks. But as soon as we told him we thought this might be a good time, we could feel the excitement build up inside him. When I kissed Bennett goodnight tonight, he threw his arms up and said, "I can't wait to go back to school. I know what everybody is going to say tomorrow." Brian and I found Bennett's last comment (the fact that he is already emotionally preparing for possibly disappointing his friends due to his bowel issues) very enduring. 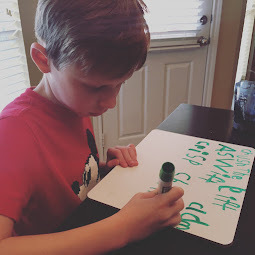 Bennett's emerging social skills, now that he's in kindergarten, are new to us. We are still reminding ourselves Bennett is a separate little person, not a baby anymore. He has feelings, friendships and desires outside of our own. I have become aware of this more since Bennett has been back at play therapy since having surgery. 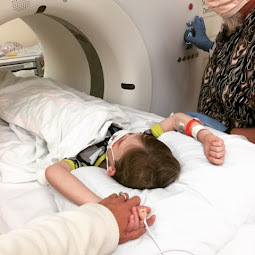 Most recently, he's been asking questions in his play therapy such as "why do I have cystic fibrosis" and sharing how he plans to ask this to God when he gets to heaven. He also has been bringing up the themes of "lies" and "being tricked." Bennett's play therapist feels he is working through his own shock, surprises, disappointments and missed expectations that he himself collected over the last four weeks when things did not go as planned. Brian and I have tried to be as honest as possible with him about every step of his surgical and recovery experience. 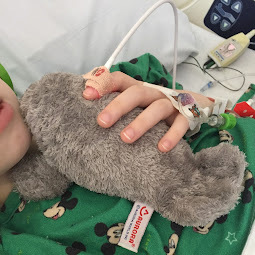 But, things have been taken out of our hands at a times - such as when his vein blew so he needed another IV or when we couldn't control his pain, or when we had to give him a clean out or when he couldn't go back to school. Losses of any kind are hard, but they are particularly hard when they have come one after another. I have wanted so much to buffer those for Bennett but sometimes I just don't get a chance. Thankfully, Bennett is resilient. We have warned the kindergarten teacher and Bennett that, if tomorrow doesn't work out as planned, I will come pick him up early from school and we'll try again a few days later. But everyone is hopeful that this is it: we may finally have found normalcy again. Hoping today went well for Bennett!